Our last year’s Outlook Report carried the headline “A 10 year old bubble about to become even bigger”, and so it did. Auction sales reached new heights in 2014 on the back of a further increase in sales for the Post-war & Contemporary, Impressionist and Modern and Old Master art market, despite a 9% decline in sales for the Chinese art market. Sotheby’s and Christie’s raised a total of $9.6 billion across these four collecting genres, a significant increase of 26% from 2013. So let’s ask the same question again: Can the current art boom last? Will the bubble become even bigger in 2015? What is fantasy and what is real? Is there a limit? And what could it be? 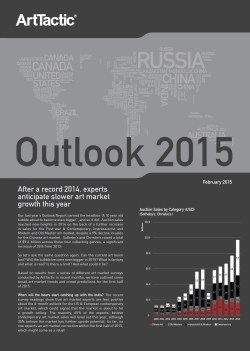 Based on results from a series of different art market surveys conducted by ArtTactic in recent months, we have outlined some broad art market trends and crowd predictions for 2015.